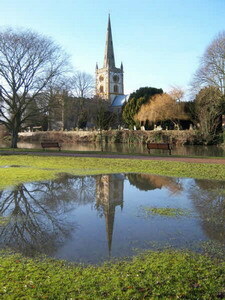 The rural town of Stratford-upon-Avon in Warwickshire, England went for hundreds of years as just that. It was a country town with a market for the local farmers and traders to sell their wares, with shops, businesses, trades and agriculture being the usual income for local people. Situated on the pretty English River Avon and surrounded by villages of thatched cottages, the people who were born in Stratford-upon-Avon generally had a pleasant countryside existence. Then came the craze for Shakespeare. Gradually over a number of years this little town has transformed itself into a place of culture and is now the second largest tourist destination in England. Scholars of English always knew that William Shakespeare was born in Stratford, but it was only in the 20th Century that serious moves were made to re-popularise his plays, so much so that a new theatre was built in his town of birth to immortalise the "Bard" in 1932. This new theatre on the banks of the Avon became a Mecca for scholars, students and theatre audiences. By employing well known as well as unknown actors, actresses, directors and staff Stratford soon became the best known Shakespearian theatre in the world. The Royal Shakespeare Company was able to expand in later years, and bought new property in Stratford to open small, intimate theatres, where the actors could talk directly to the audience. The very best actors, both in England and abroad, were often trained at the RSC in Stratford, and love to come back for a season from time to time. The RSC now performs both Shakespeare and many other authors all over the world, and is still considered "The Best" by many of even its sternest critics. So, what happened to the little market town in the centre if England? It's now a big town with a small town centre and no market. The people of Stratford have largely been pushed out of town by the incredibly high property prices. Stratford has become such a success that more than half of the smaller houses are weekend homes for the rich, and leaves many local villages dormant during the week. Shakespeare's Birthplace in the middle of town is a lovely half-timbered old house which is now trampled over by a million tourists every year. 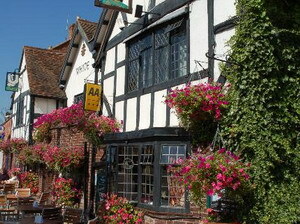 The town is within 2 hours of about 20 million day trippers living in England. The houses that belonged to William's relatives do not escape either. You can tour the whole lot on double-decker buses along what were, recently, country lanes that are now covered with various coloured lines in the middle and on both sides. The really bizarre reason to travel to Stratford-upon-Avon is to see if you can find a local person. Particularly during the spring, summer and autumn seasons you won't find many. Japanese, German, American, Korean, Swedish, Dutch, French etcetera Yes. But a real Warwickshire accent? Unlikely.